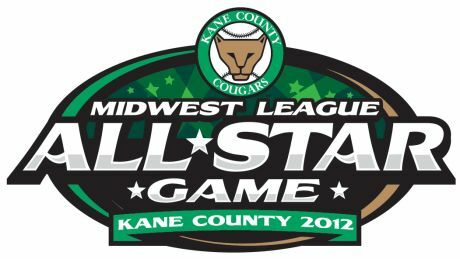 Tuesday evening the Midwest League All-Star Game took place out in whatever distant suburb the Kane County Cougars play in (don't blame me for not knowing which one, once you're outside of Cook County, it's all downstate as far as I'm concerned, even if it's a northern suburb). None of my friends were able to make the trip with me, but I'll be damned if I was going to miss the chance to see the Indians' top prospect, 18-year-old shortstop Francisco Lindor in action, so I made the 40 mile drive out to the country on my own, to see what I could see. I walked into Fifth Third Bank Ballpark (that much I know because it was printed on my ticket!) just after 3:00, as batting practice was getting started. The starting lineups were posted on a large board, and I made my way over to fill out a scorecard, because I only had three hours until first pitch, so when else would I find the time (also, it had not yet occurred to me what a disaster keeping score at an All-Star Game would be, given the many pitching and lineup changes all game long)? It was awfully damn hot out and the shade of the concourse was tempting, but after a few minutes perusing my program to get a sense of who was who (I'd made a list of the top prospects who'd be playing in the game, but Lindor was the only one I'd have recognized when I arrived), I headed back into the sunlight to do some scouting. A few dozen fans were crowded around one end of a dugout, so I went to investigate. Who did I find, holding court with the gathered multitudes? Francisco Lindor! He was signing autographs (for some reason, instead of standing somewhere people could hand him things, he was in the dugout, a few feet away and a few feet below the crowd. People tossed objects and markers to him, he signed, then tossed them back). I'm not too old to appreciate the silly rush that can come from having a stranger sign their name on some scrap of memorabilia, but I'm also no autograph hound, which is how I would describe most of the adults in this particular group: Men (and a few women) with binders of baseball cards, or boxes of brand new baseballs and cheat sheets with bits of personal information about players; they are often not afraid of being pushy, and I suspect that most of what they get signed is then sold on eBay. I think there's something a bit distasteful about it all, so I stood with the crowd, but made no attempt to get anything signed. I enjoyed just watching Lindor in that setting, feeling like I was getting some sense of him as a person (which is fairly ridiculous, I know). He was so cheerful the whole time. At one point a small boy tossed a baseball when Lindor wasn't looking; the ball rolled away unseen and the boy began to cry to his father. Not long after, Lindor picked up on what had happened, searched around the dugout til he found the ball, then signed it and climbed up to hand it back to the boy, smiling and asking his name as he did. For better or for worse, the impressions people make on us in person will always mean far more than all the stories we might hear about them from others. The twenty minutes I spent watching Lindor sign autographs, smiling to everyone, making small talk as he went, finding that kid's baseball, they will always mark him as a good guy in my book, and I anticipate his eventual arrival in Cleveland all the more now. Eventually Lindor joined his teammates in the outfield to shag flies and I moved on to watch the rest of batting practice from as close as I could stand to the cage. If I know anything about judging a player's Major League potential based on watching them go through one session of BP (and I think it's safe to say that I don't), Twins prospect Miguel Sano is going to be a great power hitter. He's only 19, but is built like an oak tree. The ball rocketed off his bat. Buck O'Neil (if you don't know about Buck, you're missing out; Joe Posnanski's obituary is a good starting point for learning about an incredible man) used to talk about how the ball just sounded different coming off certain players' bats; Miguel Sano's cuts sounded impressive too. An hour before the game, all of the players were lined up around the field, and for thirty minutes fans could roam around as lines formed to shake hands and get autographs. At this point, the fan in me won out. I pulled out the baseball I'd sheepishly brought with me from home and got into Lindor's line. Ten minutes later, I stood in front of him, and despite having seen "Jurassic Park" in theaters eleven times before he was even born (What? "J.P." viewings are how I mark 1993), I was turned into a little kid. I had my Indians hat on, which I stupidly pointed out, in case he was just waiting for an Indians fan to offer season tickets to, I suppose. I told him what a big fan I am and expressed a great interest in seeing him in the big leagues in another couple years, "even sooner, I hope," he replied. We shook hands, I wished him luck, and that was that. I quickly texted my girlfriend, who was endearingly indulging of my childish excitement. I spent the next twenty minutes getting a few other players to sign their picture in the program. Unlike Lindor, I really didn't care about others' autographs, but it was something to do, and I found it interesting to interact at least a little with players. I can't blame the ones who signed wordlessly and seemed put out by the whole affair; it was 95 degrees out, they were probably antsy to get on with the actual game, and as I said before, most of what they were signing would likely be sold for money they'd never see. That said, friendliness made a positive impression, so in addition to Lindor, I'll be rooting for Archie Bradley, a pitcher in the Diamondbacks' system who not only shook my hand, but talked about how fun the day had been already and excitedly told me, "I'll be pitching the 5th. They told me that's my inning, don't miss it." Lindor led off the game, but promptly struck out. His teammates weren't going for that though, and scored five runs before the inning was over. That was nothing compared to the 2nd inning though. Lindor led off again (that'll happen when a team scores five runs in an inning). This time he lined a single to the outfield, then stole second base, and came around to score on a teammate's hit. The Eastern team scored eight runs, bringing the score to 13-0; they would not look back. Lindor wound up going 2 for 4, the other two Indians' prospects at the game (Cody Anderson and Joe Colon) each pitched without giving up any hits or runs, Miguel Sano only batted twice and didn't get to crush any baseballs, Archie Bradley pitched a perfect 1-2-3 5th inning. If it sounds as if I'm glossing over the actual game, I suppose you're right. It was so lopsided so quickly though, and there were so many players coming in, that it didn't have the normal rhythm and flow of a ballgame. The East won 18-2, but that seemed almost entirely beside the point by the time it ended (though I enjoyed watching every bit of it). There were contests on the field, races between kids, objects fired into the crowd (including a water balloon which pretty well soaked me), but most of all, there were the ZOOperstars. As anyone who has ever seen the inflatable Raptor's incredible rollerblading fiasco knows, inflatable mascots are tremendous. The ZOOperstars are a whole gang of inflatable mascots! First out were Monkey Mantle, Manatee Ramirez, and Mia Hammster (baseball fans love soccer playing rodents too) who danced together. Later, Shark McGwire attacked a coach, then challenged him to a dance-off (because, why not? 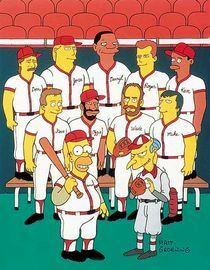 ), Mackerel Jordan swallowed an umpire, Centipete Rose danced too, and Harry Canary sang "Take Me Out to the Ballgame." I was every bit as entertained by them all as any 5-year-old. I only regret that Barack Ollama and Mario Lemule couldn't be there. All in all, Minor League Baseball acquitted itself very well. I spent the game next to a father and son from Minnesota, who were on their way to see the Twins play in Pittsburgh and Cincinnati this week. They were a pleasure to talk with, friendly and quite knowledgeable about baseball. Everyone was in good spirits, no one seemed drunk, no one taunted or shouted obscenities at any of the players. People cheered at opportune moments, laughed at the silly antics between innings, sang along with Harry Canary, and stayed around after the game to watch the Jesse White Tumblers perform, followed by a fireworks show. Even the players stuck around and watched. The game program touted that Greg Maddux, Albert Pujols, Miguel Cabrera, and other superstars each played in a Midwest All-Star Game in their day. The National League's reigning Cy Young winner Clayton Kershaw pitched the last time Kane County hosted. It seems there's a very good chance some of the guys I saw will become Major League greats. Hopefully in a few years, it's Franciso Lindor, All-Star shortstop of the Cleveland Indians. It'd be cool to say I saw him "way back when," like a music fan who brags about having seen the White Stripes in a dingy club with only 50 other people. The same goes for Sano, or Bradley, or any of the other players. So much of being a sports fan falls short of what we hope it will be. Our favorite players miss big shots, strike out in big moments. Our favorite team might never win the championship. Sometimes it feels like an utter waste of time to go on with it, a hopeless endeavor to care so much when we can control so little. We get through it by learning to enjoy the present, to be happy with whatever smaller victories we get along the way, even though tomorrow might bring heartbreak and disaster. We also learn to forget all the failures and disappointments that have come before, and to sometimes look into the future able to see only the wondrous possibilities. Tuesday was a good day for possibility. Adam Dunn, Triple Crown Winner?? ?